*Sponsored Post: This post is sponsored by truRoots but the content and opinions expressed here are my own. Looking for an easy and delicious weeknight meal idea? 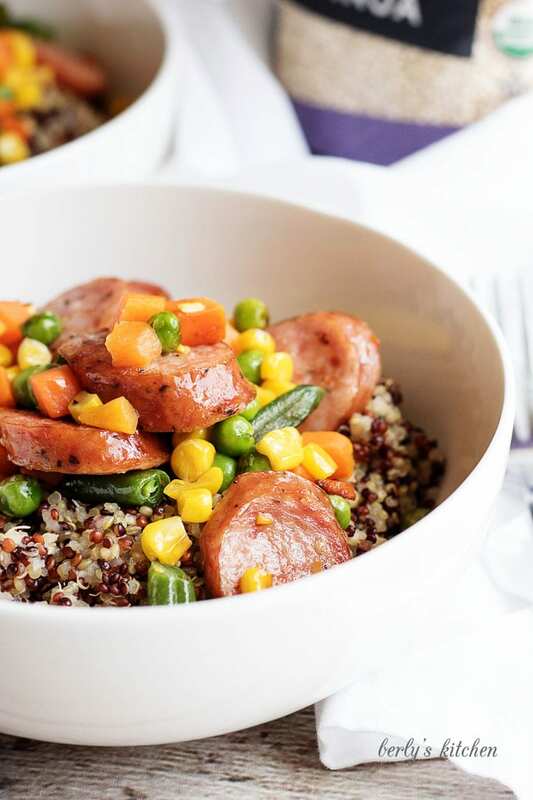 Then try our sausage and veggie stir fry over quinoa. It’s a healthier twist on a classic stir-fry! Weeknights can be hectic and trying to feed your family a health-conscious meal is a challenge. Sure, you could round everybody up and drag them out for dinner at a restaurant, but then there’s no real way to know what you’re eating. If you cook at home, then at least you know what you’re feeding your loved ones. In keeping with that theme, we decided to share a quick and delicious dish with a healthy twist. You might be wondering, what’s so healthy about sausage. 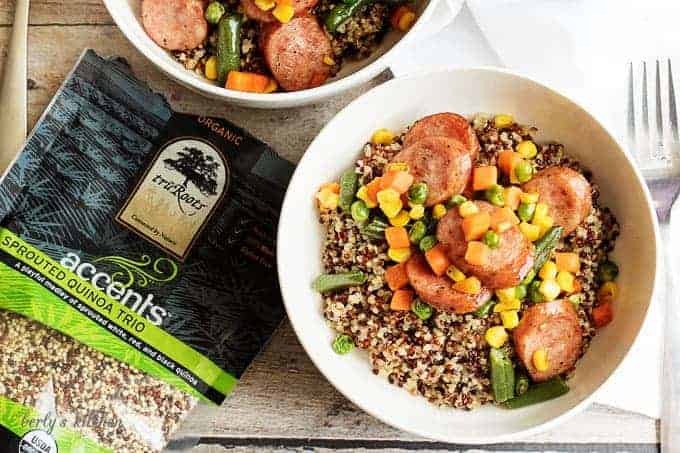 Well, while it’s not chicken or fish, we did choose an organic version of smoked sausage, along with organic frozen vegetables. Also, because we picked a fattier protein, we didn’t have to add any additional cooking oil. Furthermore, the natural flavor and spices used in curing the sausage served as our seasoning blend. That means, no extra nitrates or anti-clotting chemicals found in most commercial seasoning blends. 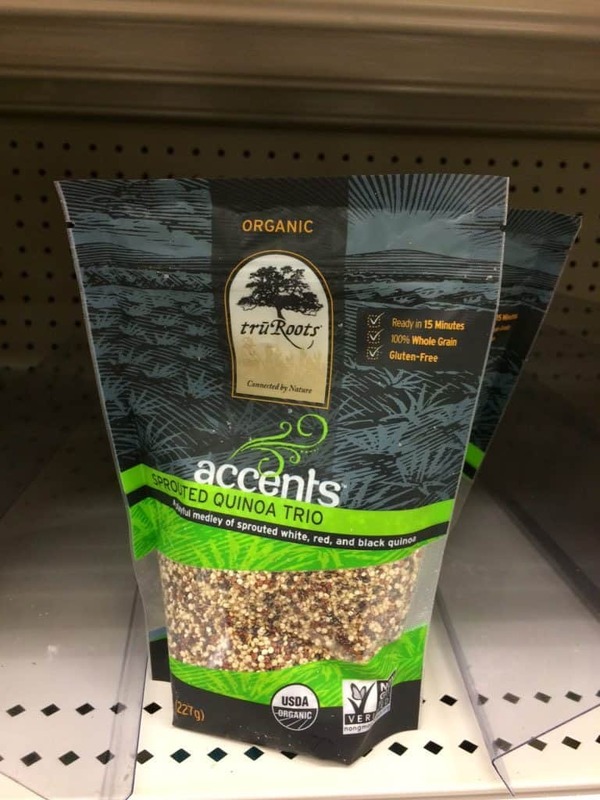 Instead of white rice, which has little to no nutritional value beyond being a carbohydrate, we substituted truRoots Organic Sprouted Quinoa Trio. It’s a filling combination of three kinds of quinoa. As the package shows, quinoa has carbohydrates, fiber, and protein. I encourage you to go to Target and give truRoots a try, especially since there is a Cartwheel deal going on right now. Getting back to the dish, the sausage, and chicken broth flavor everything perfectly. I didn’t need to use any salt or soy sauce. However, I understand that people have different tastes, so I went ahead and added a note on the recipe card about adding salt and pepper to taste. Honestly, though, I don’t think the dish needed any further seasonings. To keep the healthy twist, we used organic chicken broth. Check at your local Target to see if they carry the other organic ingredients. Using all-natural products gives you that extra peace of mind. As a father, nothing is scarier than watching your little one put food in his or her mouth from some unknown source. So, I encourage you to try your hardest to make sure every meal they eat is clean and healthy. In closing, I wish everyone a long life, love everlasting, and tummy full of quinoa. 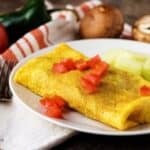 Looking for an easy and delicious weeknight meal idea? 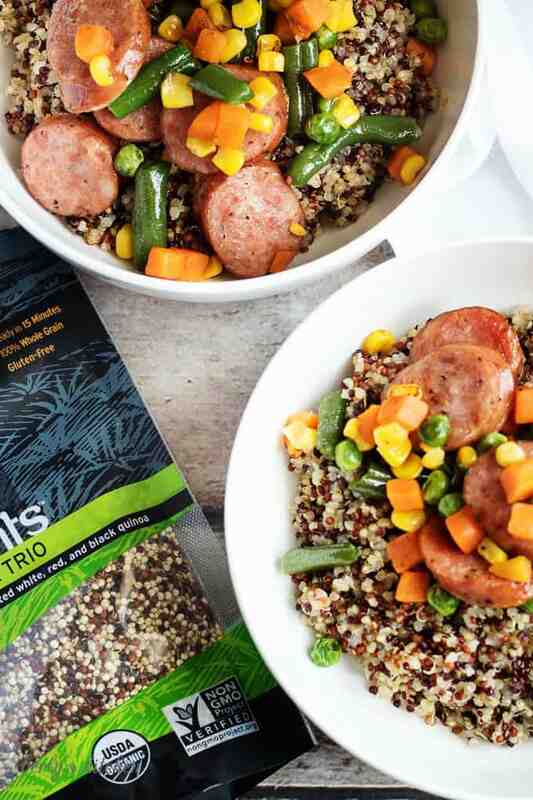 Then try our sausage and veggie stir fry over quinoa. It's a healthier twist on a classic stir-fry! First, begin by cooking the quinoa per the bag instructions, but substitute chicken broth for water. The instructions are simple to follow and only require you to bring the broth to a boil. Afterward, add the quinoa, cover the pan, reduce the heat, and let simmer for up to 12 minutes. Last, remove the quinoa from the heat and let it sit, covered, for an additional five minutes. Then fluff and serve. 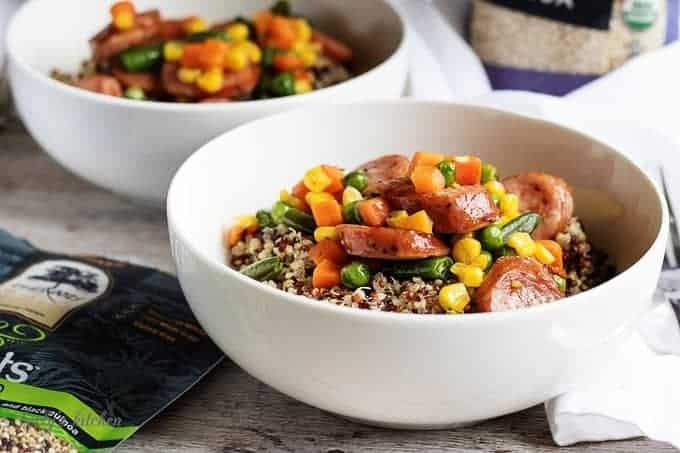 Next, while the quinoa cooks, cut your sausage into circular pieces, combine them with the frozen vegetables, and let the mixture cook in a large saute pan over medium-high heat for 10 to 12 minutes. Last, put 1/4 of the quinoa into a bowl and top it with 1/4 of the vegetables and sausage. Serve the dish while it's hot and use salt and pepper to taste. The calories listed are an approximation based on the ingredients. Actual calories may vary. Can be stored in your fridge in a sealed container for up to three days. I didn’t know that target carried sprouted quinoa. We usually sprout our own. Thanks for the information. That will make life easier around here, and get dinner on the table more quickly. I agree that when using smoked sausage, it usually adds sufficient flavor to any dish that no additional seasonings are needed. Thanks for this recipe. I have everything that I need, except for already sprouted quinoa, to make it in my pantry and freezer. what a simple and flavor dinner! i usually make stew with quinoa but stir fry sounds like a delicious idea. 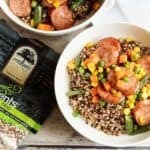 I just love adding a nice spicy sausage to a grain dish like this. My favorite is a nice Spanish chorizo chopped, stir fried and added to some rice. This looks so good! This looks like the perfect way to introduce quinoa to my son. 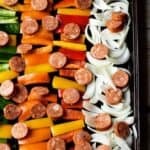 What a nice idea to stir fry sausages and veggies together. A nice ,easy and quick recipe and very healthy. Thanks for sharing. This looks DELICIOUS! Such a great protein-packed meal. Quinoa always keeps me full for so long. I love the idea of adding stir fry on top. My husband would love this! I love quinoa. Its such a versatile grain and goes well with almost anything. I usually have it with some chicken but stir fried veggies sound even better. The best thing about quinoa is how fast it cooks LOL _ So much faster than my usual brown rice! Tastes good, too. 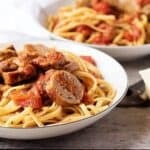 And yes, I love using sausage for quick meals because that takes care of the seasoning right there – quick and easy! I love dishes like this! Meat, vegetables, and grains – It’s earthy and healthy but filling. Perfect! You have NO idea how much I needed this EXACT recipe right now!! I just bought these sausage links at Costco and I’ve been eating them as a snack (high protein and good fat)…this is a PERFECT way to get in some carbs to make this a balanced lunch! I love this! Printing this off now!! I love adding sausage to dishes and for some reason had never thought of stir-fry. Can’t wait to try this! 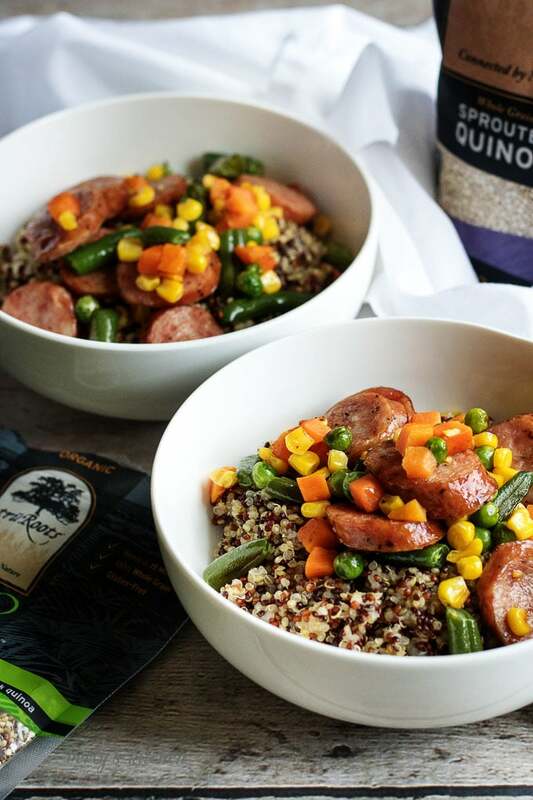 I have made a similar sausage and veggie recipe but have never tried Quinoa. The next time I’m at the store I’m going to pick some up and give it a shot. Thanks! !